Shiitake mushroom growing on wood. Image credit: Wikipedia. (PhysOrg.com) -- Japanese farming folklore has it that lightning makes mushrooms multiply, and new research supports the idea. Mushrooms form a staple part of the diet in Japan, and the fungi are in such high demand that around 50,000 tons are imported annually, so scientists have been experimenting with artificial lightning to see if it could increase the crop. A four-year study carried out at Iwate University in northern Japan on ten species of mushroom (so far) has shown that for eight of the 10 mushroom species a bolt of lightning-strength electricity could double the crop yield. The best improvements were found in the popular nameko and shiitake mushrooms. The experiments were carried out by seeding logs with mushroom spores and then applying high-voltage electricity pulses to the logs. A direct hit by natural lightning would burn and kill mushrooms with up to a billion volts of electricity, so the researchers, led by Associate Professor of Engineering, Koichi Takaki, thought the increase in numbers of mushrooms, if it occurred at all, could be caused by exposure to a weakened charge that would travel through the soil after a nearby lightning strike. They therefore used less damaging pulses of electricity. The experiments showed mushrooms react best when exposed to a ten-millionth of a second burst of electricity at 50-100,000 volts. Under the best conditions the nameko yield was 80% greater than the untreated control crop, while the shiitake crop yield doubled. Takaki said the mushrooms initially decrease the enzyme and protein secretions from the hyphae (tiny filaments that spread under the surface, acting like roots and giving rise to the fruiting bodies such as mushrooms), but then suddenly increase production. The reason for the reaction is unknown and the subject of further investigations. 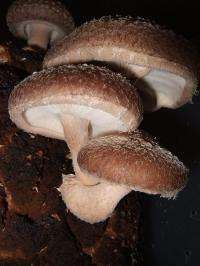 One of the researchers, Yuichi Sakamoto of the Iwate Biotechnology Research Center, said it is possible the reaction is a response to danger, and the mushrooms react by giving themselves a reproductive boost and increase the number of fruiting bodies so their chance of survival is maximized. Takaki and Sakamoto think the equipment they used could eventually be adapted for use by commercial mushroom growers. The effects of artificial lightning are also being studied by Takaki’s team on daikon radishes, and by other researchers on beans, rapeseed plants and some lily varieties. So far the early results look promising. The attack of the mushrooms. ummm. I may just be ignorant but grew up farming and this is well known. Lightning releases nitrogen into the atmosphere, combines with rain, and falls on the ground. Lightning storms make things green and grow faster and better. That may be, but many folklore things that are "common knowledge" or "well known" turn out to be untrue or even (in rare cases) to have the opposite effect of what is claimed (IE, the "well known" healing properties of megadoses of lead and arsnic in oriental "medicine". Heh). So these things need to get studied. I love the reaction to articles like this. When the folklore turns out to be false, the comments are filled with the "Duh, of course it's false. It's just folklore. Silly scientists are wasting money studying this!" When the folklore turns out to be true people comment "Well duh, of course it's true! Everyone knows that it's true. This been known for thousands of years! Silly scientists are wasting money studying this!" It looks like the poor scientists can't win for trying:P.
Sally Pringle Amazing discovery! This explains it! I had a flash of lightning shoot up my spine ten years ago and became chronically ill immediatly after that! The mushrooms started growing ten fold which caused my arthritis like pain! I new there were little micotoxins lodging into my joints. Everyone called me a nut. Then I read about Straus Creamery Brothers & the discovery of converting cow poop into energy! I realised that the nerves fired off in our stomach based on the energy, generated by the bacterias eating sugars in our gut. This feeds the fungas, the candida! Ladys & Gentenmen we have the answer to Spontainious Human Combustion! Once again i was labled a crazy lunatic! Gotta love it! Its a done deal now, I know! Maybe I should get a tesla coil and experiment on all my plants. Actually, there were already experiments over half a century ago with the Lakhovsky Multi-Wave Oscillator that proved how life forms respond to Longitudinal EM Waves. Then came Dr. Rife with his Plasma Wave. Seems to me these guys are rediscovering the wheel. I can't help wondering at the choice of mushroom in this experiment - shiitake? That explains the x-ray, ct-scan, causing cancer. They zap you enough times and the fungas starts to grow. This web like fungas consumes your whole being. The good mushrooms & the bad mushrooms! It all depends which one grows inside of your body that determines the type of cancer or other funk you have to deal with. Like the good bacterias and bad ones this cancer or fungas grows based on the ecosystem it has to thrive on. You decide the enviornment for your body chemistry. The good mushrooms must remove the bad ones from our system like the bacterias do? I like to drink 9.5 H2O and try to eat a diet rich in enzymes, live food, gluten free & organic. Applied kinesiology is The Missing Link for obtaining a customized blueprint into homeostasis. You eat live things? You monster, I make sure they are dead first. Additionally I hope everything you said was a troll.Otherwise the world has no hope, just none. This technique would be useful for strengthen meat grown in laboratory vats for synthetic meat production, YAY NO MORE STRINGY MASH! Put stress on plants and they will flower/bear fruit. I remember my biology teacher coming in with a young pineapple plant and showing us how to make it bear fruit much earlier than it would under regular cultivation conditions: by smacking it around a lttle with a baseball bat.